SAVE THE DATE: Sat. 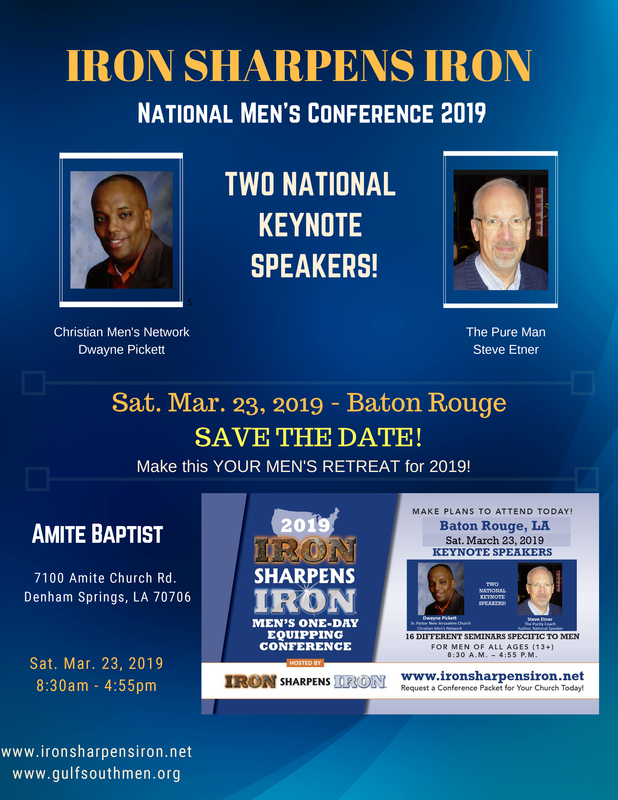 March 23rd, 2019 – Baton Rouge Iron Sharpens Iron Men’s Conference! Dwayne Pickett and Steve Etner! Gulf South Men is the local host ministry for Iron Sharpens Iron national conferences for men. 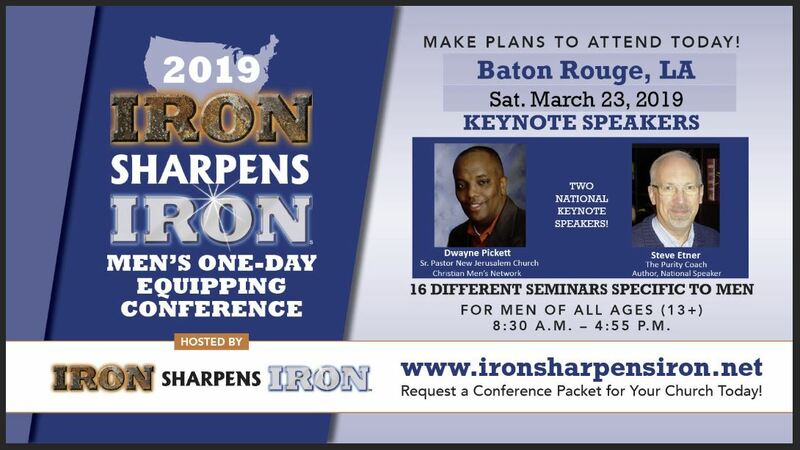 The Mission of the IRON SHARPENS IRON Conference Network is to mobilize regional ministries to resource local churches with a first class one-day equipping conference that is specifically designed for men (age 13 and older). Events are custom tailored to provide valuable equipping resources for your church designed to assist the church in the mission to disciple men. Featuring nationally known, world-class keynote speakers these dynamic events energize men while at the same time giving them real meat to take back home. One unique distinctive of Iron Sharpens Iron are the 16 breakout seminars on topics that meet men right where they are, offering real and useful resources. Each breakout session is lead by a national leader in each subject matter adding great value to the event! Designed to serve churches as their Annual Men’s Retreat and Annual Men’s Training event this event features 16 Breakout Training Sessions! Featuring TWO nationally known Keynote Speakers this is a MUST DO event for your church! Want to know how to recruit the men of your church to join you? Click HERE. For more information follow this link: Click HERE. Also check out the national Iron Sharpens Iron website: Click HERE. To register your group go to: Click HERE. CLICK ON VIDEO BELOW for ISI Info! 2018 Baton Rouge IRON SHARPENS IRON will feature special new awards and drawing prizes! Life size real BRAVEHEART SWORD as a new traveling Award for Churches that bring the most men to ISI. FREE DRAWING FOR ALL ATTENDEES! !